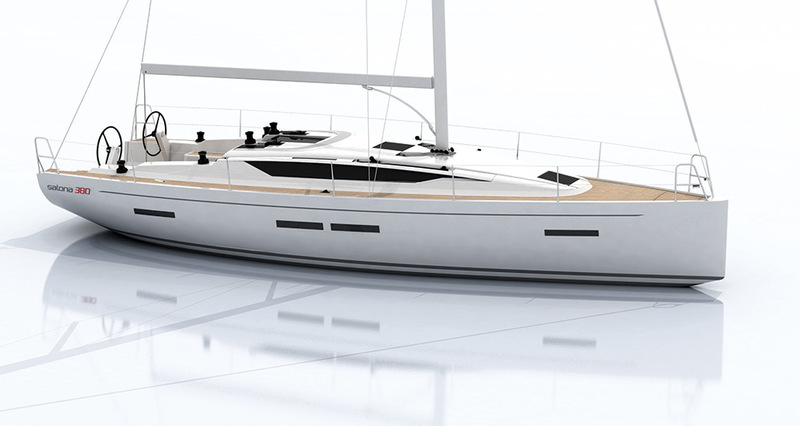 Cossutti Yacht Design designed this new Salona model, the 380. That is a new design office to me. The design of the 380 is similar to the bigger Dehler 42. The two designs, despite the 2-foot 8-inch difference in LOA, could be siblings. The Salona has more overhang than the Dehler. There is a total of 5 feet 3 inches of overhang in the Salona and some of this is in the bow. This is a function of the elevated forefoot knuckle. The D/L is 172 and the L/B is 3.11, very close to the Dehler 42’s numbers. In plan view both boats are nearly identical with the Dehler having perhaps a slightly sharper entry and slightly more beam at the transom corner. Looking at the plan view aft, the Salona tucks in. I’d like to see that deck line straighter and more like the Dehler’s as it approaches the transom corner. You can choose from two keels. The two keels shown on the sailplan are very close in draft but one has a T-bulb and the other simply a flared tip. The standard layout is simple but very effective. There is a large double quarterberth to port. The head to starboard has a shower stall. The galley is adequate. It’s hard to work in a good-sized refrigerator on boats like both the Salona and the Dehler when you eliminate the aft leg of the “U.” The refrigerator or icebox gets shoved outboard where the hull is tapering and there is just not much volume there. I have heard people say that in Europe they eat ashore more and don’t need large ice boxes. Maybe an Igloo cooler on the quarterberth could remedy this. The nav station is tight but there is room for a laptop computer. The sailplan gives a SA/D of 21.27 using 100% of the foretriangle. Spinnaker halyards are optional according to the specs so I suppose you could have a fractional asymmetrical chute and a masthead asymmetrical chute if you liked. I like the look of the boat. Again, it has the wedgelike deck structure and a moderately high freeboard. Sheer appears to be dead straight but it looks fine to me. The obligatory long, rectangular, fixed hull ports are there. LOA 38’1”; LWL 32’10”; Beam 12’2”; Draft 6’11”; Displ. 13,669 lbs. ; Ballast 4850 lbs. ; Sail area 904 sq. ft.; SA/D 21.27; D/L 172; L/B 3.11; Auxiliary Yanmar 29-hp diesel; Fuel 26 gal. ; Water 48 gal.